Each year, 15 million girls still marry before the age of 18. While progress has been made towards gender equality around the world, there’s still much further to go – particularly in some countries, where governments have been trying to roll back women’s rights. Child marriage and female genital mutilation (FGM) are widespread, women in developed and developing countries shoulder the majority of unpaid work and, despite representing half the global population, they hold less than a quarter of parliamentary seats. How can we close the gender gap in unpaid labour? But Goal 5 of the UN’s Sustainable Development Goals (SDGs), which focuses on gender equality and the empowerment of women and girls, aims to change this. These four UN charts show how far the world has come over the past few decades on the journey to gender equality, and also the enormity of the task ahead. 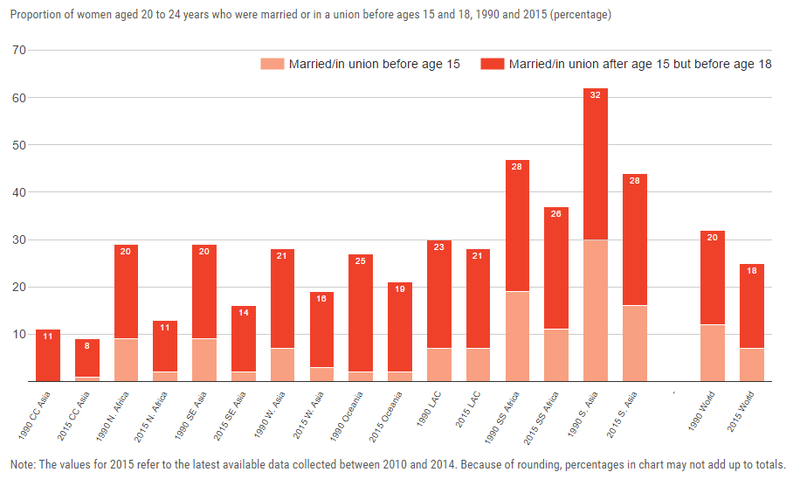 Globally, the proportion of women aged 20 to 24 who reported that they were married before their 18th birthday dropped from 32% in 1990 to 26% in 2015. And the figure for marriage of girls under 15 dropped from 12% to 7% over the same period, demonstrating that social norms are gradually changing. Northern Africa has made the greatest progress in reducing child marriage overall – the share of child brides in the region fell by more than half over the last 25 years, from 29% to 13%. However, each year 15 million girls still marry before the age of 18. The practice is most common in Southern Asia and sub-Saharan Africa, with rates of 44% and 37%, respectively. In more than 90 countries, child marriage is not only culturally and socially accepted: it’s written into the law. A report from Unicef found that FGM is more widespread, and affects many more women and girls than previously thought. Around 200 million women and girls worldwide are thought to be living with the consequences of FGM or cutting – 70 million more than reported in 2014. FGM is particularly prevalent across Africa, the Middle East and Asia. In Somalia, the worst-affected country, 98% of women have been cut. Overall, rates of FGM have fallen by more than 25% over the past three decades. But today, in the 30 countries where the practice is concentrated, more than one in three girls aged 15 to 19 has undergone the procedure, compared with one in two in the mid-1980s. Women across the world take on the majority of life’s unpaid work, including child-rearing, looking after older relatives and housework. They spend 19% of their time each day on unpaid labour, compared with 8% for men. The burden of unpaid care responsibilities and domestic work, in addition to paid labour, means that women and girls work longer hours than men and boys and have less time for rest, learning and other activities, which contributes to gender inequality. 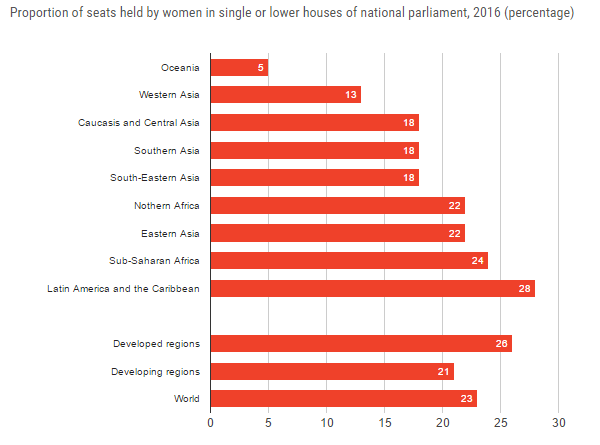 Women remain underrepresented in politics, holding just 23% of parliamentary seats worldwide. This represents a rise of 6% over a decade. However, women are making faster progress in parliamentary leadership positions. In 2016, the number of women speakers of parliament rose from 43 to 49 (out of the 273 posts globally); women accounted for 18% of all speakers of parliament in January 2016.